When you think of Tropical Smoothie you don't think about them having food. I mean they are a smoothie place after all! Well we took a trip out there for dinner to try out a few different menu items. I wanted to try a few different things so we got 4 different items and shared everything. 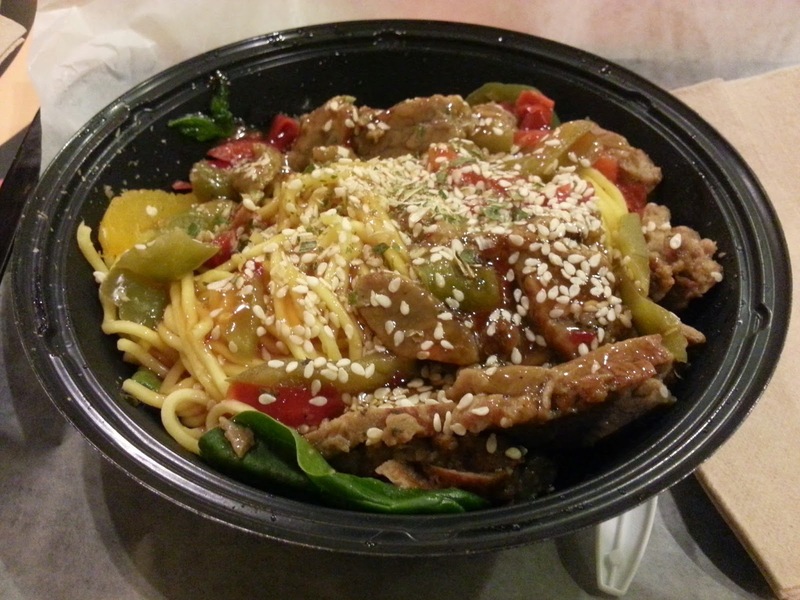 We tried one of their limited time menu items, Spicy Mongolian Steak Bowl. It had Steak, red & green peppers, baby spinach, scallions and noodles with sesame seeds and Spicy Asian BBQ Sauce. To be totally honest, we did not like this at all. It came in a plastic container which immediately gives the impression of a microwave meal. It actually tasted like one as well. I was expecting a nice, fresh steamed noodle dish, but this tasted and looked like it came right out of a freezer. Next up was the Buffalo Chicken Wrap. 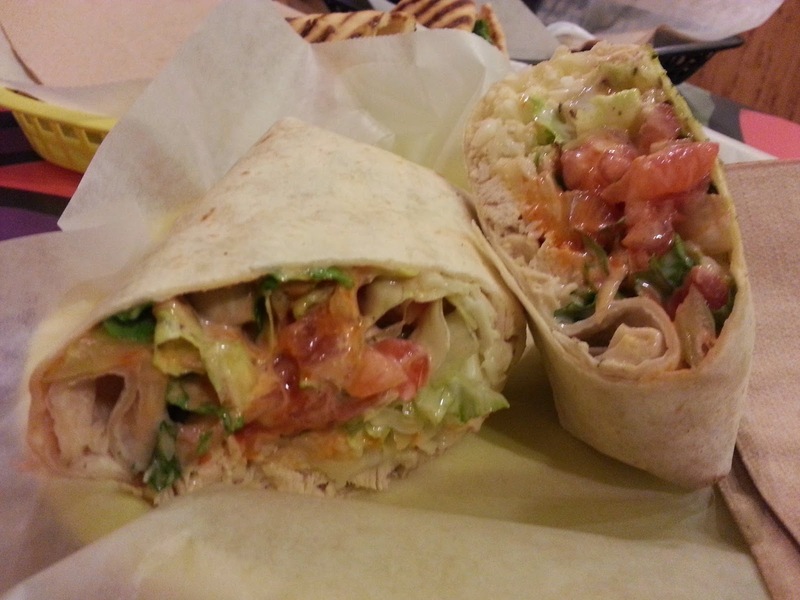 It had Chicken, Low-Fat Mozzarella, Tomatoes, Romaine, Buffalo Sauce, Light Ranch in a Toasted Flour Tortilla. I actually ordered mine without the tomatoes, but the wrap still had them in there. It wouldn't have been so bad if it was a few, but it was loaded with them. I ended up picking them all out and moving on. The actual taste of the wrap was very good, but it didn't have that much chicken in there. It was more tomatoes than anything. Our next wrap was the Thai Chicken. 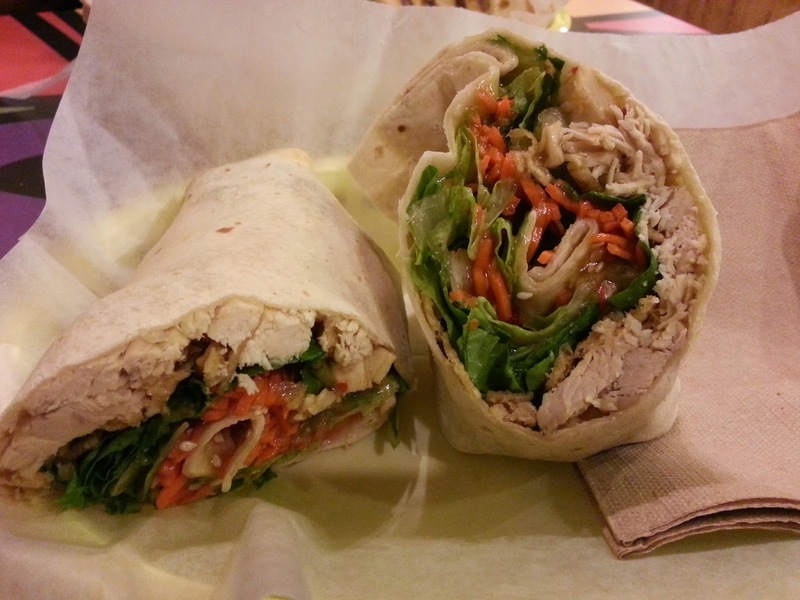 It had Chicken, Wontons, Carrots, Sesame Seeds, Romaine, Thai Peanut Dressing in a Toasted Flour Tortilla. I hate to say it, but we weren't a huge fan of this one either. Just like the buffalo chicken, there wasn't much chicken in the wrap. However, there were tons of carrots. 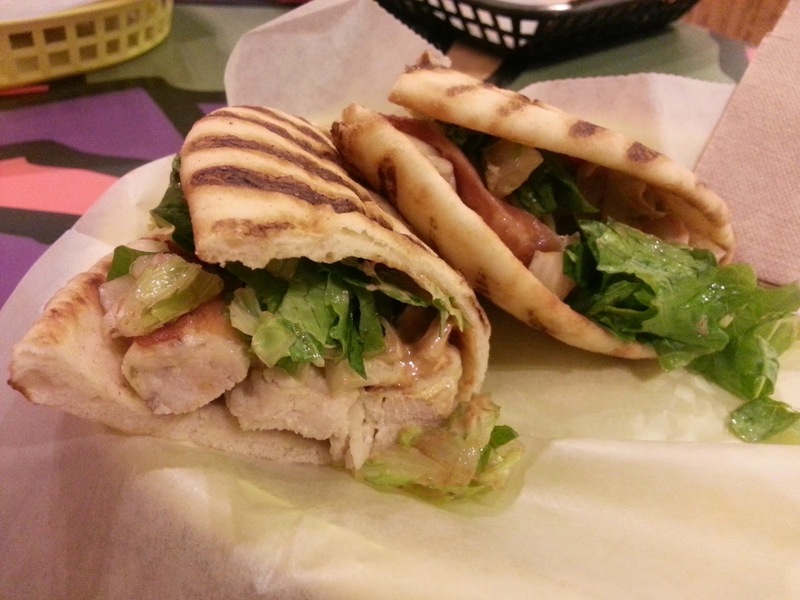 Our last item was the best of them all, Chiptole Chicken Club Flatbread. It had Chicken, Pepper Jack, Bacon, Romaine, Tomatoes & Chipotle Mayo on a Toasted Flatbread. We really liked the bread, and it had a very nice flavor to it. It's not that anything was bad, it just wasn't what I was expecting. I could see Tropical Smoothie being a great place to swing by for lunch if you are in the area. I really liked the flatbread and I would like to go back and try some of the other ones that they offer. I intentionally did not review any smoothies on this trip. I have had them before and they are great, but I wanted this review to be on the food only.